Breeze came up about 20, gusting 25, at the start. Jens Osterlund led at first weather mark and let it all hang out down the tight reach. 1t was not easy to find a path down the waves and he crashed big time. Ten boats rolled by him and he never got back into the race. Robin Wood and Ola Barthelson opened up on the fleet with Wood remaining ahead for most of race, with Ola getting by him on the last beat. Third was Olle Bergquist. followed by Simon Allen, Erich Chase climbed through the fleet to finish about 6th, with Bill Beaver a few spots back. Paul Miller blew up his goose neck, Dave Gilliland and Del Olsen retired after breaking tiller extension tips, Dawn Miller and Bruce Bradfute beached it and Fran DeFaymoreau and Mark Hughes ended up towards the back of the pack. At this juncture both the Brits and Swedes seemed strong. Wind dropped to about 13 during the race and then backed hard, 15 degrees, before the last beat. The day was hot , about 90, dry and bright. 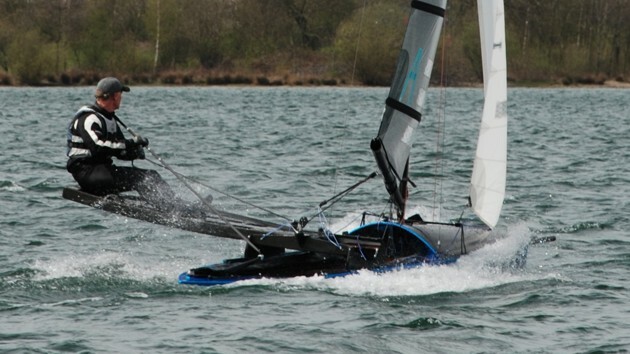 The wind was forecast to be harder for the opening days racing, If we only knew! The racing didn't happen. A desert wind blew up out of the west at 30+. According to the locals, this apparently precedes a big shift to the south and then we should get back to relatively normal conditions... although no one has really figured out what is normal quite yet. Good conditions for a small power kite, or Chris Converse on one of his big wind small boards. The , Swedes brought a Trampofoil with them, which was a big hit with the IC sailors after the opening ceremonies. An - immersed rear wing and. above it, a bar to stand on, with a front foil steered with handle bars. To make it work, you push off a dock and jump up and down. Done right you move along at 6-10; done wrong you sink. A potentially commercially viable product, although it may need some design modifications so that it can be water started. Race l goes off in a 6-10 knot building NE breeze. A 10 degree shift about a minute before the start makes it impossible to cross the line on starboard, the fleet is forced to flop onto port at the start and everybody is late. Going right is good and at the weather mark it is Paul Miller in the lead followed by Tim Wilson of OZ and Robin Wood, Beaver is in 5th, Del 6th. Chase around 25th, The rest of the U.S contingent is well back. At the bottom mark the breeze was up to l5. At the top of the 2nd round, it was Wilson, Wood, with Miller about 5th. After the 3rd round , Miller had dropped back more; Wood and a couple of Brits were now ahead of Wilson with Beaver hanging on to 5th. At the finish it�s Wood, Colin Brown, Mark Goodchild, Ola Bartheleson (who Beaver had let sneak past), Bill at 5th ahead of Wilson. Del slipped to 12th. Erich Chase at 23 ahead of Miller who it turns out had about 5 unscheduled dips in the pool. Gary Boell at 36, Big Dave at 42, Bruce at 44 (who had had a slide shoved through his jib at the leeward bottom mark, Fran 45. Mark Hughes 47. Dawn 50. In for lunch, then out for a late 3pm start, pushed back since the morning race went off an hour late. The Northeaster died away giving way to a whistling NW squall descending out of a clear bright sky, about 30. The lucky ones used the leading edge to hide up under the new weather shore. For the rest, carnage, with maybe 30 canoes or more over at any one time. Several ended up on leeward beach, others tipped over and waited until the wind dropped. The Northwester finally abated, the fleet righted itself and sailed over to the hide out spot, where it was blowing NE from the sea. 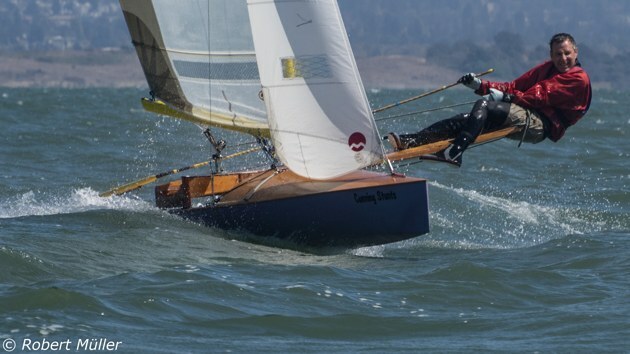 The race was finally abandoned after it turned out that the starting line was in a NE sea breeze and the weather mark boat still had a strong NW wind. So now Sunday, Monday and Tuesday are now scheduled with two races a day. 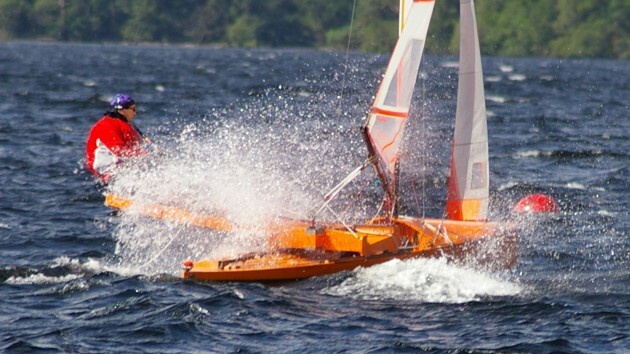 Some damage in the dinghy park, mostly in broken tiller extensions, and a few outright rudder failures on the British team. Tools are being freely wielded around the German compound as well. The U.S. team are going to need to get squared away to get ahead of the Swedes in order to challenge for the cup. Well folks, this was a weird one; the morning race in NNE 8-10 under lowering cloudy skies shifting about l0 715 degrees. Major winds blowing aloft with big swirly gray clouds. 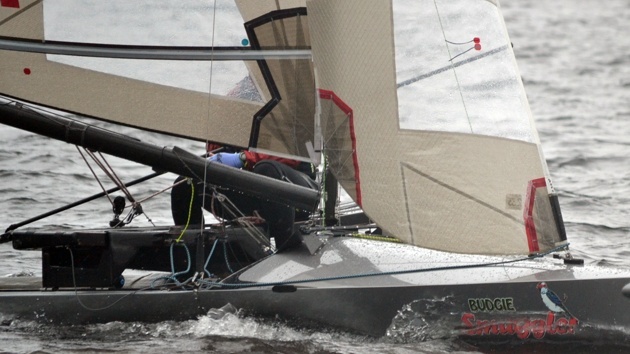 The second race after lunch was hit by a line squall - 25 gusting to 40 - with rain which died completely alter the second windward leg to 0-3 then switched to south. 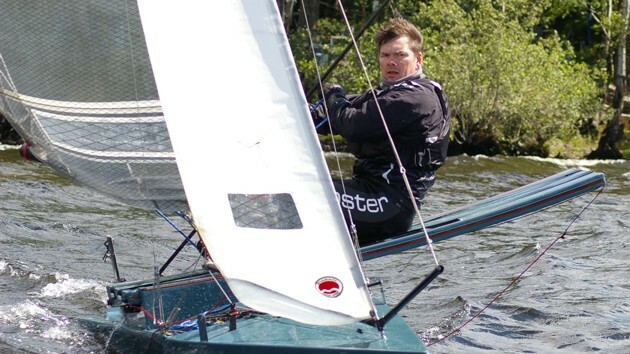 In the first race Paul Miller starts strong ; rounding in 4th place at the first weather mark; behind 3 Brits. Del at l7. Beaver 18. Rest of the U.S is well back. Boell 19, Chase 25. Things do not improve as Miller moves backward in pack and no one else moves up. Colin Brown 1, Mark Goodchild 2, Robin Wood 3, Ola Barthelsson 4, Anders Petersson 5. Paul ends up around 12, Del about 14. Not a good race, and the Swedes looking pretty good for the New York Cup challenge. Lunch and then head back out for a 2 p.m. start. The stragglers get off the beach at 1:30 and most of them, in hindsight, wish they had stayed on the beach. As the last get off, the squall hits. Boats over everywhere. dragging through oyster beds. The lucky ones hid out on islands. On the spectator sailboat we were making l.5 knots to windward with full power. By 2 p.m. the wind starts to drop and IC's emerge from their hidy holes, ready to duke it out in another heavy air race; about 25 knots. The start goes off about 3:30, spectacular heavy weather start with folks steaming down the line in clouds of spray. Unfortunately there was massive general recall. About 4U on the line. So we lose a few and try it again. Lots of dips in the pool on the first two tacks. 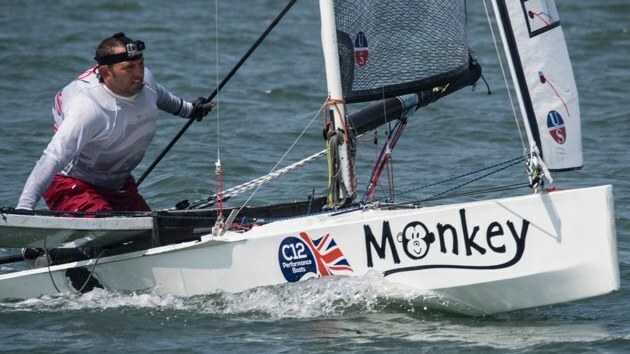 Up at weather mark, the retirement rate is fierce, including most of the British team, notables like Robin. Barthelsson first at weather mark, then Berquivst, followed by Chase. The San Francisco lad finally has a breeze to his liking. Seth Dunbar in 4, then a Swede, then another Aussie, then Jens from Germany. another Aussie. two more Swedes, Simon Allen, another Aussie and Gary Boell. Del about 23, having had boat damage in the dusty stuff, several US at the tail end. Of course, by this time only about 30 left racing. Leaders go fast around twice, but by the time they get back to weather mark for the next reaching leg wind goes to virtually nothing. Chase manages to pick off Olle down the reach which turn into a long port tack beat as the wind shifts lightly into the south, almost 180 degrees. Somewhere in all this Beaver starts to race again. His shroud adjuster cable exploded and with it, the mast went over the side. Bill rolled up the rig and waited for a tow. Finally, tired of waiting, he took a bit of Spectra and stood the rig back up and started racing, miles behind. In this race, Australia does really well with most of team finishing. as so the Swedes. The U.S had 4 tiller and other repairable breakage dropouts. There was only one Brit in the top 1U, with only about 5 Brits finishing: casualties included Wood. Goodchild. and Brown. Best German finish with a 6th for Jens. But Swedes have 3 of top 6 spots. The U.S takes solace with Erich's second. the best individual U.S finish yet. Once we get off water. somewhat after 6 p.m., we find that two Brits had seriously bruised ribs. Amazingly, given the conditions, all boat damage is minor. So far Port Stephens gets the award for the most changeable weather I've ever seen. Just to punctuate it, the day finishes up in a spectacular thunderstorm. Will be interesting to see if it will rain kangaroos and wallabies next. The weather continues punishing the IC's. Yesterday finished in a spectacular lighting storm with a few canoes blowing over in the night. The day starts out with streaming puffy clouds being driven by about 30 knots of wind, maybe higher gusts. The nasty stuff switches from west to south in mid afternoon after a rain squall, and drops to a light 20-25 southerly, so the decision is made to go afloat, anticipating a further drop. Some do. The smarter ones don't. At least that is the way it turned out after the IC's got beat up for an hour as marks dragged and it was generally difficult to set the course. All compounded by another rain squall. So... tomorrow Day 4 they are going to get on the water early and try for four races; they need at least two to have a championship. Standings now are Ola. Olle, and Simon Allen; if there are throw outs, Robin, Mark, and Colin could be in the money. Racing starts at 9am. Finally a day like Eric Dunbar promised. A SSE breeze that progressively moved easterly: up and down, maximum strength around 12, under fluffy cumulus clouds scudding along. Morning races are on short courses, probably 8 miles in length. In the first race, Eric leads at first windward mark followed by a Swede and a gaggle of Brits. Robin Wood is laying S. By the end, the lead has swapped around and I don't remember who won, Colin Brown, I think, Eric was second, Wood third. In the second morning race, Wood wins, Eric second. Del and Bill do OK as does Paul in the first race. The Swede, Anders Petterson, is showing well, finishing in top five as Well. Going into lunch, we have a series. and Ola is probably first, Eric maybe 4th. The race after lunch is vital to the Brit cause as the best of the Brits all have DNFs in the third race. A really long course is set (1.5-8 mile legs), most of us not really understanding why. After a general recall Miller gets away best and finishes about 6th. Robin wins with Petersson 2nd. Del and Erich have rotten starts and spend the race climbing from the mid thirties to the low 20s high teens. Beaver managed to rip up his knee falling off his boat looking at dolphins and is not on the water. 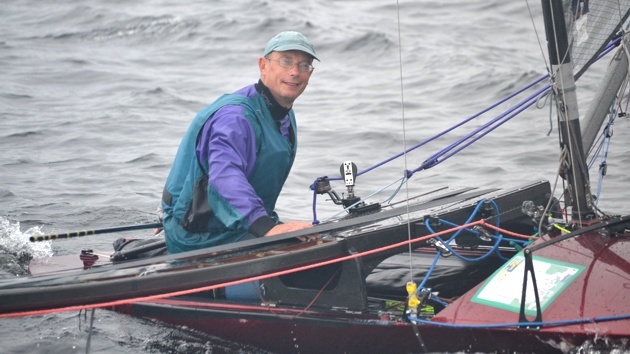 Bruce Bradfure also is out, having a multiple stitch cut in his cheek after not getting away from the boom on a jibe. Not enough time to run a 7th race and we call it a wrap around 5:30 PM. At the end of the day the final results have Robin Wood as World Champion with Mark Goodchild 2nd, and Anders Petterson 3rd who noses Ola out by having a worse throw out. Ola is fourth and Chase about 6th or 7th. Del does a 19th and Miller is up there somewhere. So tomorrow its Brits against Swedes for the NYCC. Brits are very well prepared and well practiced in large fleet racing. A couple of Germans are quick as are a few Aussies ( who appear to be good heavy weather sailors). Swedes are fast in a blow. Americans erratic as hell. Lack of big fleet and time in the boats really shows. But speed is not bad amongst top 4. Robin has a very powerful adjustable rig that has him off the end of the seat when similarly sized people are thinking about getting out to end. Ola has some pretty interesting things going on with flexible tips as does Robin. We need to figure out how to give the US the fleet experience needed to be consistent and we need to take it all seriously enough to spend more time in the boats. These results don't ocr readily -anyone fancy transcribing them for me?